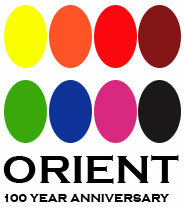 Orient opened our USA operations in New York City in 1979. In the following years, we would open our first production plant and warehousing in Newark, New Jersey in order to better serve our North American customer base. On September 21, 1991, we moved our manufacturing operations to Seaford, Delaware. This is one of the world’s most technologically advanced manufacturing sites for the production of Nigrosine Dye. Orient Corporation of America is happy to celebrate 40 years of business in the United States of America and wants to thank everyone involved in this great accomplishment. In 1917, a limited partnership company, Orient & Co., Ltd. was established. Since then, ORIENT has consistently supplied new materials to meet the needs of the market, combining unique technologies that use dye syntheses with new synthetic technologies. Products are manufactured today with environmental awareness, and global safety concerns are at the forefront of our operations. Orient Chemical Industries is happy to celebrate 100 years of manufacturing in Osaka, Japan and would like to thank our partners throughout the world for helping to achieve this accomplishment.